Paul went before Governor Felix in our last lesson. This week, Paul goes before Governor Festus. Then, Paul stood before King Agrippa and he is almost persuaded. Review: Remember that Agabus warned Paul not to go to Jerusalem. Paul went to Jerusalem anyway, because he was willing to do whatever God wanted him to. Paul was beaten by the crowd and the chief Captain, Lysias, put him under protection and when Paul’s nephew heard that 40 of the Jewish men plotted to kill him, he went to the prison to tell Paul. When Paul’s nephew informed Lysias of the plot, Lysias had soldiers take Paul out of Jerusalem. Paul went before Felix. He was a very bad Roman ruler. Felix kept Paul a prisoner for 2 years. Lesson: Scripture for today is Acts 25 & 26. Then, finally, Felix was sent to Rome and Festus took over. He went to visit Jerusalem to check out the capitol, and while meeting the with the high priest, the same men that wanted Paul killed, were still angry at Paul, and they talked to Festus. Since Festus was a new governor, the Jewish leaders tried again to have Paul taken back to Jerusalem. They wanted to kill him on Paul's journey back. Festus didn’t know about their plot. 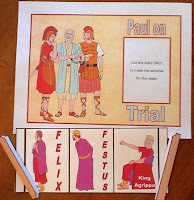 They told Festus THEIR STORY about Paul, and of the things THEY were accusing him of. 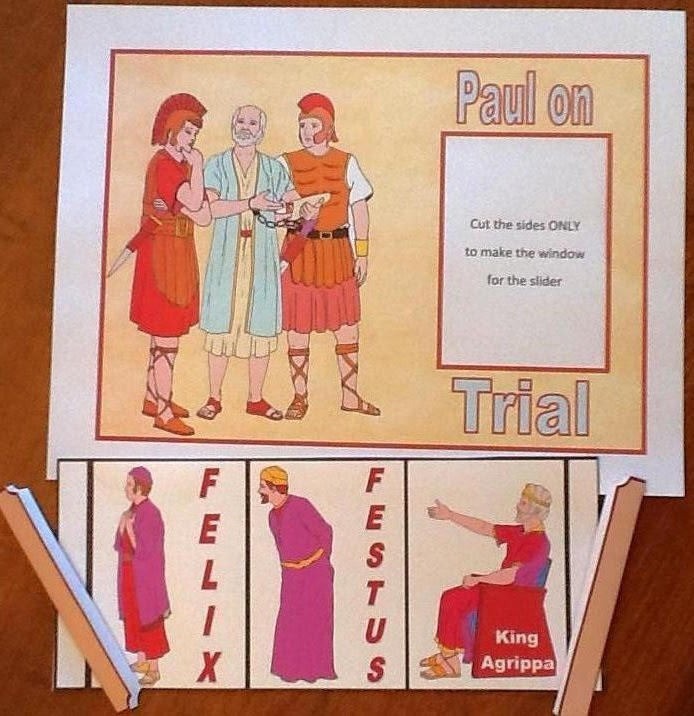 Festus couldn’t deny Paul, because of his Roman citizenship. 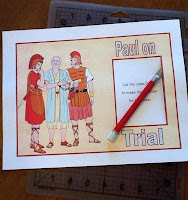 So Festus agreed to send Paul to Rome to be tried in Caesar’s court. As Festus wondered what kind of report to send to Caesar, King Agrippa and Queen Bernice visited. They ruled Galilee. 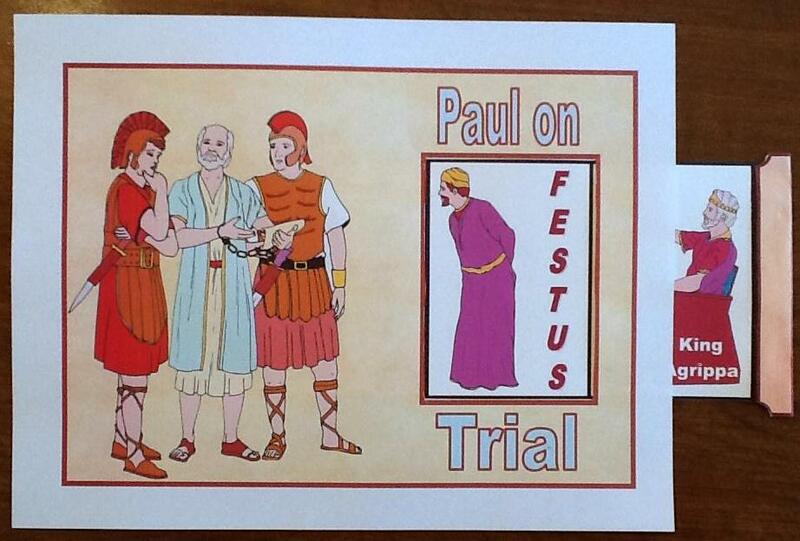 They stayed with Festus for many days and Festus told them about Paul. When Festus explained Paul’s story, King Agrippa wanted to talk to Paul. The next day, Paul had another hearing. King Agrippa and Queen Bernice came in to see Paul with 'great ceremony" [pomp]. Other important men attended also. Read Acts 26:3 Paul tells King Agrippa that he is an expert of customs of the Jews and even he is questioning what they are saying. And Paul is happy to be able to speak to him with the truth. Paul told King Agrippa that he is just saying the same things that the prophets said. Moses said that a Savior would come and suffer and then rise from the dead, Who was Jesus. In Acts 26:28 King Agrippa told Paul that “Almost you have persuaded me to be a Christian.” Paul knew that ALMOST was not enough. We sing a song called "Almost persuaded”. King Agrippa didn’t want to give up his lifestyle. King Agrippa didn't want to live like Jesus wants us to live. He knew Paul was right, but just wasn’t willing to change his life. 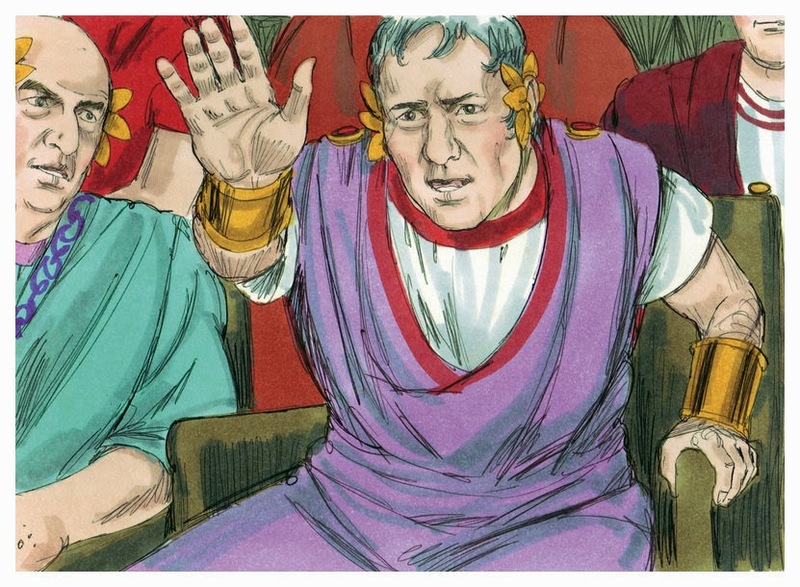 When King Agrippa stood up, that meant that he didn’t want to hear anymore. The guards took Paul back to his prison, while King Agrippa, Queen Bernice and Festus talked about Paul. 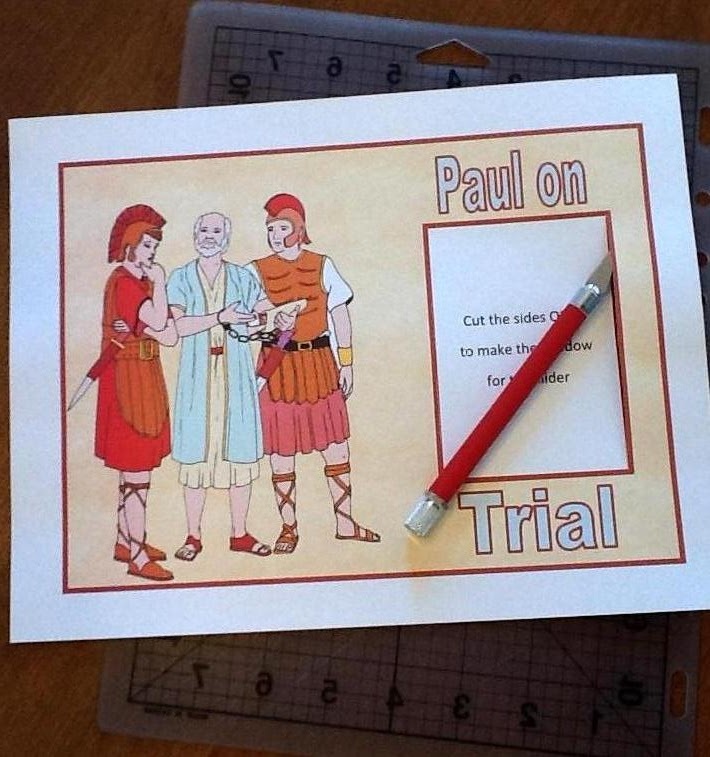 They knew Paul didn’t do anything wrong, but since he appealed to Caesar, they decided Paul had to go to Rome for a trial. This is today's project, except that I put together the project (for my age group) and we use it during the lesson, then it is for them to take home. Cut out the parts, and then as you can see from the first photo, I used a craft knife to make the slits on the sides of the inside box for the slider to go through. Fold the tabs in half, and push the slider through, from bottom to the top, and back through the back. It should look like the next photo. Then, glue the tabs on each end of the slider to keep it from falling through. I used Aleene's Tacky Glue to glue the tabs on the ends. The Spanish translations are through Google Translate, so sorry if something isn't correct. Thanks for visiting and leaving the nice comment! It is appreciated! Thank you so much for all your work, helps me a lot in preparing my lessons every Sunday. I could have not done it without you. May our Lord bless you more every day!